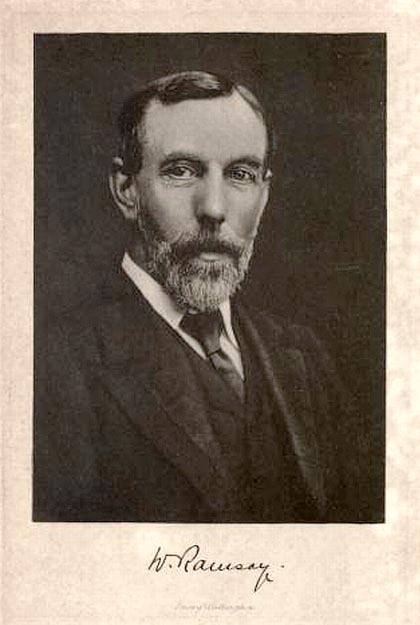 William Ramsay (1852-1916) was the most distinguished Victorian scientist to be associated with University College London. He was Professor of Inorganic Chemistry there from 1887 to 1913, won the Nobel Prize for Chemistry in 1904, and became the University of London's first Professor Emeritus on his retirement. Another of those eminent Scots who contributed so much to the university in its first century, Ramsay was born and brought up in Glasgow. His father had started out as a civil engineer, and there was a strong family background in the sciences: as he explained in his Nobel Lecture, his paternal grandfather was a "chemical manufacturer in Glasgow" who "came from a long line of dyers," and his maternal grandfather was a physician who had practised in Edinburgh, and "wrote a series of medical textbooks." So although the young Ramsay developed several lifelong interests, for example in music and poetry, he soon settled on science for his future career. After attending the Glasgow Academy and then Glasgow University, he went to Germany in October 1870 to study at Robert Bunsen's laboratory in Heidelberg, but in the end studied instead under Rudolf Fittig at the University of Tübingen. Having started there in April 1871, he was awarded his doctorate in 1872 for a thesis on the toluic and nitrotoluic acids. He was not yet twenty. After that he became an assistant to the Professor of Applied Chemistry at Anderson's College, Glasgow, then a tutorial assistant at Glasgow University, before accepting the chair of chemistry at University College Bristol in early 1880. A genial and energetic man, he was appointed principal of the college in the following year, soon after his marriage. He was already established as one of the foremost chemists of his day when he took up his appointment at University College London in 1887. Ramsay's earliest biographer writes that here "the chair of Chemistry had been occupied from the first by professors of the highest rank and of world-wide reputation"; nevertheless, the new professor had to deal with "peculiar and disagreeable circumstances" at first, because of the clutter that had accumulated in the laboratories and the need to repeat his chemistry lectures again for the separate groups of medical students and women. Luckily, unlike Charles Wheatstone and James Clerk Maxwell, the distinguished scientists who had taught at King's,* Ramsay had a flair for lecturing and was "very popular" with his classes in Bloomsbury (Tilden 102, 105, 107). He was certainly progressive in his thinking as a university teacher, warmly welcoming the integration of women students into the mainstream when it came (it certainly saved him repeating his lectures for them), keen on the "continental Seminar" (Ramsay, Essays 243), distrustful of examinations and their results as a means of student evaluation, and, with his "purely chemical students, ... always anxious to encourage original investigation" (Tilden 111). One of his innovations was to encourage glassblowing, at which he himself was adept, so that laboratory equipment was made as needed, and exactly to specifications. He was also skilled at assembling this apparatus, and there are some wonderfully Heath-Robinson diagrams in Morris Travers's book to prove it (Travers was a later assistant who also wrote a biography of Ramsay). Nicknamed "the Chief" by his students, Ramsay was clearly respected and well-liked by his colleagues as well; they "found him charming, witty, and generous" (Watson). This must have been a cliff-hanger for Rayleigh. 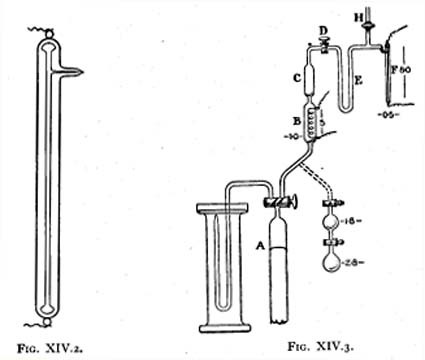 The results of the pair's experiments, announced at an Oxford gathering that summer, were met with "curiosity mingled with incredulity" by British scientists but "accepted almost immediately on the other side of the Atlantic" (Tilden 132), which tells a great deal about the scientific establishments in the two countries. The discovery of helium soon followed. In 1898, with Travers, came krypton, neon and xenon. In this way, Ramsay's work "helped complete the periodic table and contributed to subsequent theories of atomic structure and valency" (Oldroyd 135). Ramsay was a talented linguist who had always loved travelling. Sometimes he went with his wife, who had a brother out ranching in Montana and was equally adventurous. Now, however, he took a well-earned break from the lab in the summer of 1895 with his colleague from the English department, the literary scholar Professor W. P. Ker. The pair went off to Iceland, and Ker has left an amusing account of Ramsay begging a bottle from some washerwomen and stepping out to capture some gas from a spring. Ker thought the effort wasted (looking at the "empty" bottle, the washerwomen must have thought so too), but Tilden reports that Ramsay did get some argon. On the same holiday Ramsay confesses in a letter home that he has surreptitiously taken samples of some rock near a mine, "lest perchance it might contain helium" (qtd. in Tilden 236). Such incidents build up a delightful picture of an academic to whom work was also the most fascinating of his many hobbies. During the 90s, Ramsay was almost equally involved in administrative matters, helping to re-organise the university and change it from an examining-board into a fully-functioning place of learning: "Believe me, the examination should play only a secondary part in the role of the University," he wrote (Essays 244). In keeping with the University of London's global outreach, his interests extended far beyond the capital itself. Another of his trips was to India. At the invitation of the wealthy industrialist and philanthropist J. N. Tata, he and his wife made a long visit there in 1900 so that he could advise on the setting up of the now highly-respected Indian Institute of Science. He had helped individual Indian students in the past, and took the opportunity to immerse himself in the culture. It was he who chose Bangalore for the site. His own accounts of his experiences as he travelled round the sub-continent are fresh even today, and Tilden, who includes them in his biography, says that "the glowing memories and the friendships formed and consolidated there coloured all his after-life" (256). When the institute was established, Morris Travers became its first director, from 1907-1914. Ramsay lived well beyond the Victorian age. He brought distinction to his department in 1904 by being the first British person to receive the Nobel Prize for Chemistry (Lord Rayleigh won the Nobel Prize for Physics in the same year), and more discoveries followed those of the inert or noble gases, particularly in the field of radioactivity (see chronology). Most notably, perhaps, Ramsay was one of the first scientists to appreciate the possibility of radiotherapy, studying with his medical colleagues the "curative action of radioactive substances in malignant disease"; indeed, Travers goes so far as to say that in this "he stood alone" (209). Ironically, and possibly as a result of his exposure to radioactive substances, he himself died of nasal cancer at the age of 63, not long after his retirement to Hazlemere in Buckinghamshire. A school there has since been named after him. Amongst other memorials to him, there is a wall-plaque in Westminster Abbey, a Ramsay Memorial Fellowship at University College, and a plaque to commemorate his work at the site of his laboratory, now occupied by the Slade School of Art. In later life, it seems, Ramsay may have become a little harder to work with. Travers knew him a good deal more intimately than Tilden, and he includes a criticism of "the Chief" by another of his collaborators, Frederich Soddy, to the effect that that he was rather too quick "to let go sheet anchors" and trust his own findings (qtd. in Travers 292). However, without such leaps of faith Ramsay might never have made the discoveries that he did make. There was also a problem because of the war, when Ramsay created a stir by turning violently against the German scientific community, with which he had for so long had a very close and fruitful relationship. No doubt, as George Kaufmann generously suggests, this is best seen in the context of the time, and of his own painful illness. On the whole, his friends, students and colleagues remembered him with great affection, as "cheerful, inspiring, enthusiastic, full of ideas, and ready to give information or discuss any difficulty" (Tilden 299) — in short, the most sociable and good-natured of scientists. *Amusingly, in his Essays Biographical and Chemical, the outspoken Ramsay says it was "a thousand pities" that King's College was ever founded. Surely all that was needed, he says, was a theological college in Bloomsbury? He adds tactfully, "However, what is done can't be undone. . . . We are now friends, and have been friends for many years. May that friendship long continue!" (228) — remarks that do not quite compensate for what has gone before! Kaufmann, George B. "Sir William Ramsay: Noble Gas Pioneer — On the 100th Anniversary of His Nobel Prize." Viewed 24 March 2007. Oldroyd, David. "Chemistry." Victorian Britain, An Encyclopedia. Ed. Sally Mitchell. New York & London: Garland, 1988: 134-35. Ramsay, Sir William. Essays Biographical and Chemical. London: Archibald Constable, 1908. _____. Nobel Lecture, 1904. Viewed 21 March 2007. Tilden, Sir William A. Sir William Ramsay: Memorials of His Life and Work. London: Macmillan, 1918. Travers, Morris W. The Life of Sir William Ramsay, KCB, FRS. London: Edward Arnold, 1956. Watson, "William Ramsay (1852-1916)." The Oxford Dictionary of National Biography. Online edition. Viewed 21 February 2007.